We're so excited about the release of the Deluxe Flower Shaping Paper. It's so amazing to work with! 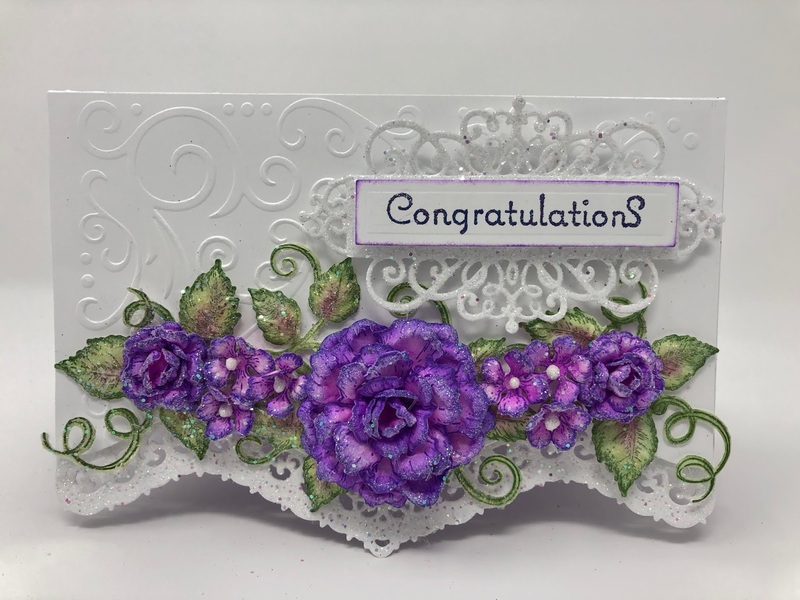 My roses and leaves on this card were all created with this awesome paper. Instructions:Card Size is 5 x 7”. Cut white cardstock 7 x 6” score at 1” and fold. Cut another piece of white cardstock 7” x 5”. Cut unfolded edge of 7 x 6” cardstock using Classic border basics die. Sponge the edge using dries clear adhesive and sprinkle with Rajni Chawla’s Crystal Clear glitter. When dry, adhere the two pieces of cardstock together using dries clear adhesive to create the 5 x 7” hinged card base. Cut white cardstock 4 7/8 x 6 7/8” diecut the edge using the plain die from the Classic border basics die. Place this piece in the embossing folder and run through the diecutting machine. 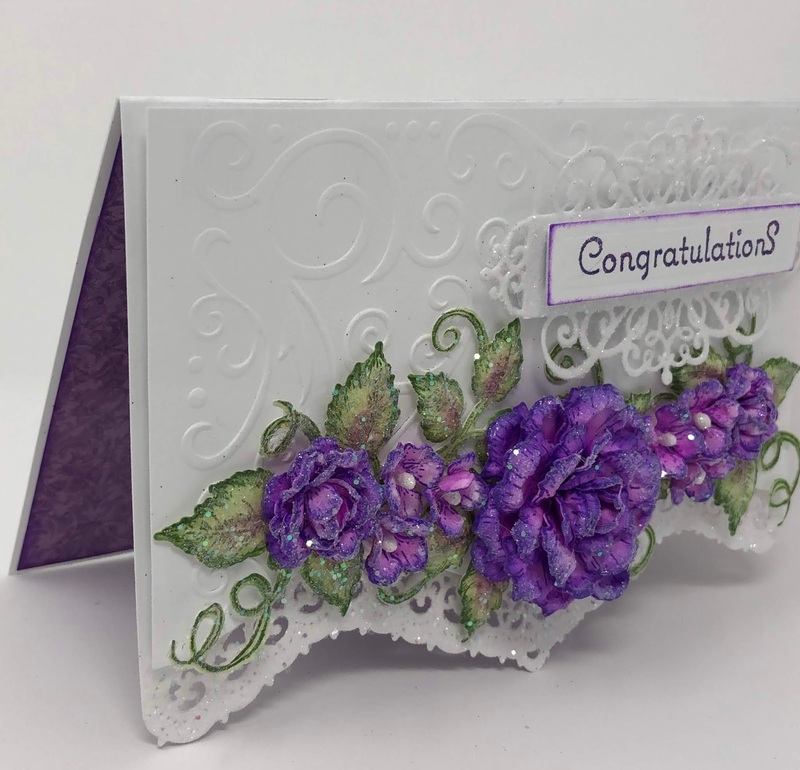 Adhere to the card base using dimensional dots. Cut paper from the Burst of Spring Paper Collection 4 7/8 x 6 7/8”, ink the edges with Majestic Violet ink and adhere to the inside of the card using dries clear adhesive. Diecut the decorative die from the Ornamental Tags Die 2x from white card stock. Adhere the two together, one right side up and one upside down. Sponge all around the edges using dries clear adhesive and sprinkle with crystal clear glitter. Stamp the sentiment on white cardstock using VersaMark, sprinkle with WOW Persian Indigo Embossing Glitter and heat set using the Heat IT tool. 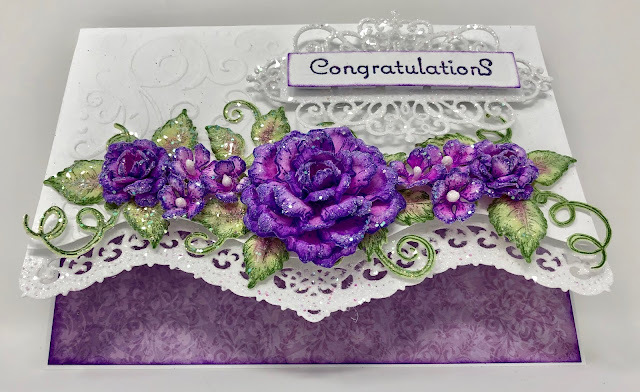 Diecut using the inside die from the Ornamental Tags Die and ink the edges using the daubers and Majestic Violet ink. Adhere to the decorative tag diecut using dimensional dots and adhere to the card base using dimensional dots as shown. 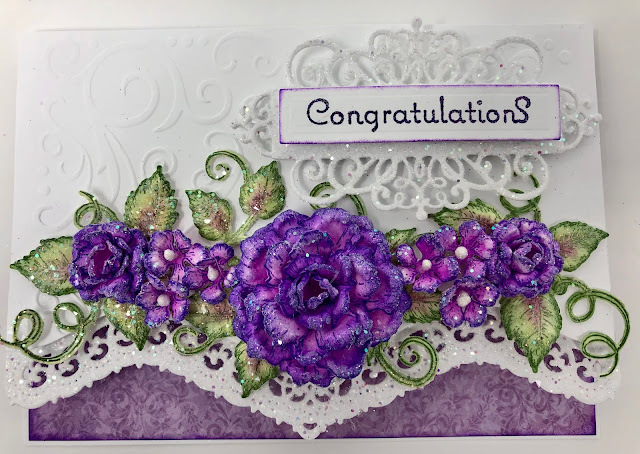 Stamp the classic rose on Deluxe Flower Shaping Paper using Majestic Violet ink, color using Majestic Violet and Cactus Flower inks, diecut using the coordinating die and shape using the Rose shaping mold. Finish shaping using the Deluxe Flower Shaping Kit. Layer petals together to create roses. See video above. Sponge with dries clear adhesive and sprinkle with Rajni Chawla’s Crystal Clear Glitter. 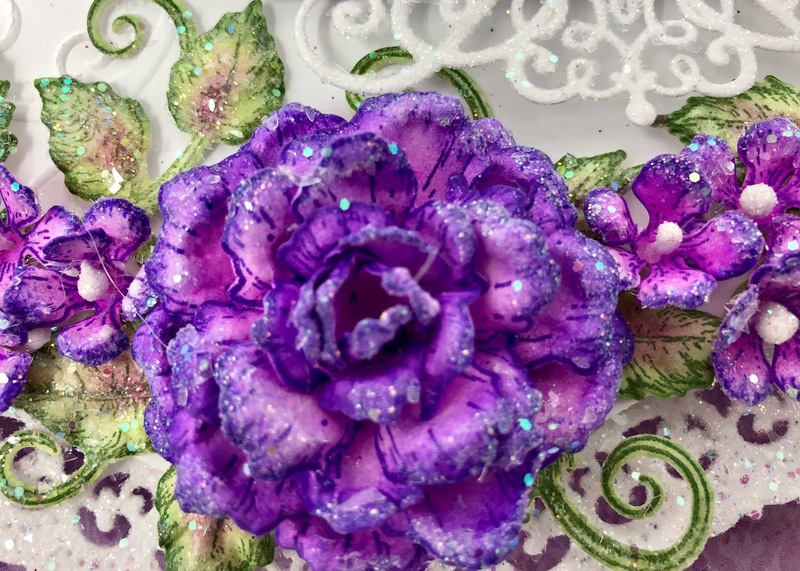 Add stamens to the smallest flowers using hot glue gun. Please be sure to stop by the Heartfelt Creations Blog to see all of the beautiful projects created by the fabulous design team. You out did yourself with this beauty!!! Beautiful roses - love the colours!